I just can't seem to get enough pictures of our little feathered visitors! First, because they are so much fun to watch and, second, because I have a camera that actually will take decent pictures! 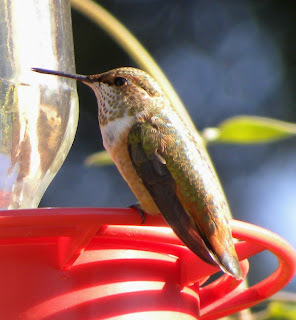 This is a female Broad-tailed Hummingbird. The female Broad-tailed and the female Black-chinned look similar but the Black-chinned is slightly smaller at just a smidgen under 4 inches. I love the way her back shines emerald green with touches of orange in the sun. The male Broad-tailed have a bright red throat patch (gorget) while the male Black-chinned have (surprise, surprise) black throats. Look at her tongue! 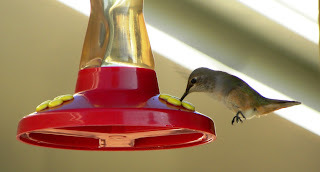 They need long tongues to get nectar from flowers or from our feeders. I was just lucky to get this shot! 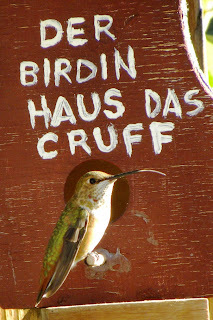 She is sitting on the perch of a faux birdhouse we have near the feeders. Notice something missing in this shot? It looks like she has no wings! They move so fast, the camera doesn't even see them. 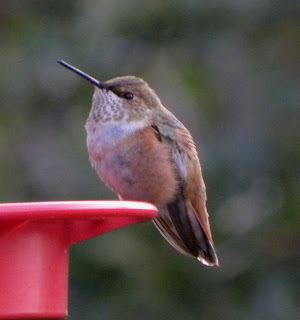 This is the bully - Ms. Rufous Hummingbird. She rules the feeders!